First things first » Blog Archive » What a hoot! I’ve been wanting to knit myself an Owls sweater ever since I first saw it, and over the past few months I’ve done it! My friend Gina was also keen to knit one of these, so we decided to do our own little knitalong. She finished hers in about a week, but mine took a bit longer. I actually knit this sweater twice. (Fortunately, bulky-weight yarn knits up fast! First, I knit both arms using the size 10.5 needles the pattern specified. When they were done, I decided I didn’t like how snug they were and reknit them on 11 needles. Then I knit the body, moving the shaping from the back to the sides. (This was Gina’s great idea. We agreed that the shaping lines in the middle of the back just looked weird.) I was about five rows away from binding off when I ran out of yarn. ARGH! This turned out to be a good thing, though, because it gave me an opportunity to reknit the body. It turned out that I wasn’t such a fan of the shaping. 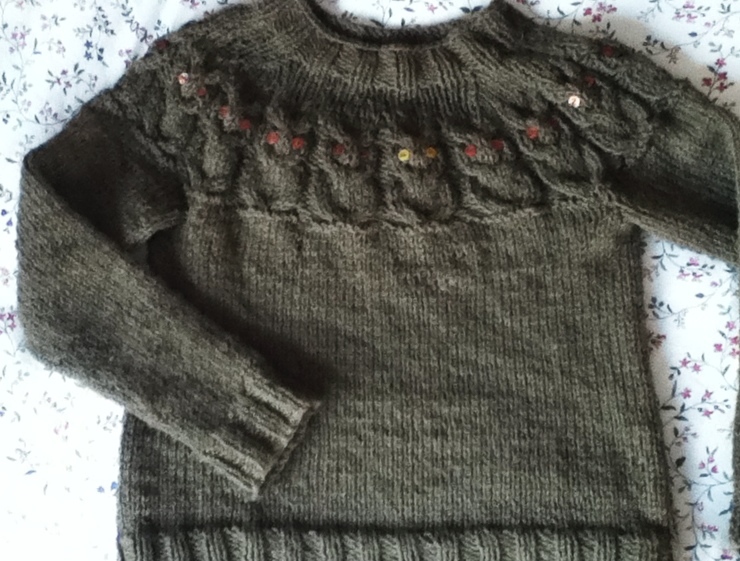 A yarn this substantial works best (for me, at least) in a looser garment. Taking another cue from Gina, who had found the as-called-for-in-the-pattern neckline too wide, I added a few rows of stockinette (with decreases) between the owls and the ribbing. The result is wide enough not to feel constricting but not so wide that it’s calling off my shoulders. The knitting on this sweater was complete about two weeks before the “official” finish date. I bound off the last stitches the day before cool autumn weather arrived and just had to start wearing the sweater immediately. I thought about omitting the button eyes entirely, but after two weeks of living with sightless owls I decided to go ahead and add the buttons. I did one set of eyes in tawny yellow (to make it stand out from the crowd) and the rest in an amber color. 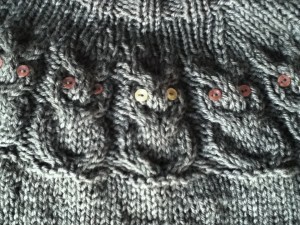 The contrast isn’t huge, but it’s enough–and well worth the couple of hours it took me to sew on thirty-six buttons. This was a fun knit, and I’d make it again. Maybe next time I’ll turn it into a cardigan! Marsha recently posted..What a hoot! I love this sweater! I know the Owls Sweater has been out in the knitting world for a bit now and everytime I see someone knit it, I fall in love with it all over again. I would knit it for myself if my girls weren’t so big. This type of sweater doesn’t flatter me at all. But it’s just so dang adorable. I bet it looks fabulous on you! Great job! @Deborah: You can totally knit this for yourself! 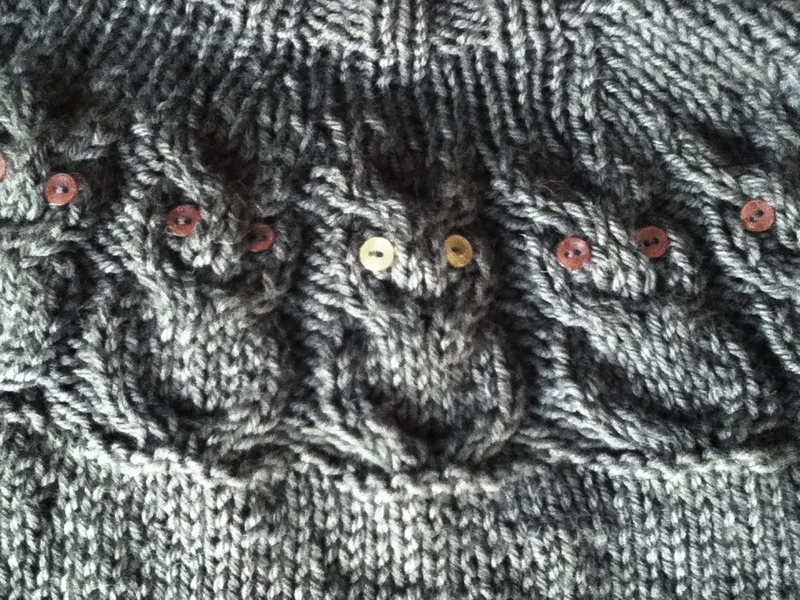 I think it would be easy to move the placement of the owls toward the neck a bit and off “the girls.” Also, I think if you eliminate the shaping and just knit this as a loose sweater (as I did), the result won’t draw so much attention to your bust.